Launching the Craftybase Referral Program! 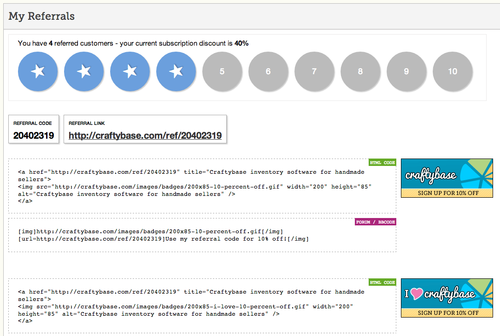 We’ve just released a way to earn huge discounts off your monthly subscription fee - it’s called the Craftybase Referral Program. Get someone to become a paid subscriber using your unique referral code and you will both receive a 10% discount off your subscription. In your settings pages, you’ll now find a new Referrals page that will give you a running tally of how many people you have successfully referred to Craftybase. On this page, you will find your unique code and the url you can provide to others, along with some fancy little icons and graphics you can use on your blogs and forum posts. Add your referral link to your email and forum post signatures. If you have a blog, add one of our fancy graphics on your sidebar to encourage click-throughs - or make your own graphic to suit. But don’t take this as a definitive list - feel free to use your referral code wherever and however you like!